Tell Brak, ancient Nagar, located in the Upper Khabur plain of northeastern Syria, was one of the royal centers of northern Mesopotamia during the fourth and third millennia BCE. The site was part of a major route connecting the mountains of Anatolia with the large cities of southern Mesopotamia and was also located at the boundary between the rainfall agriculture zone and the arid steppe, used by nomads for pasture land. The marker points to the location of Tell Brak. Since Brak is one of the largest tells in the region (c.40m high and c.800x600m in size), it was one of the first to attract archaeological attention. Max Mallowan excavated at the site in 1937 and 1938 (sponsored primarily by the British School of Archaeology in Iraq). His team recovered evidence of the “Eye Temple” (named for the hundreds of small "eye idol" figurines found mixed into the mortar of the temple itself) of the fourth millennium BCE, and the “Naram-Sin” palace from the late third millennium BCE, built at a time when Tell Brak was a northern administrative center of the Akkadian empire. Excavations at the site were resumed in 1976 by David Oates of the University of London, and during the 1990s briefly under the field direction of Geoff Emberling of the University of Michigan. Renewed fieldwork began in 2006 led by Augusta McMahon (University of Cambridge), but has been suspended due to the on-going conflict in Syria. 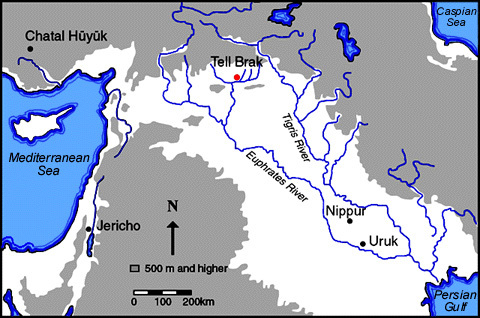 The excavations of the 1990s were investigating two periods in the history of the site: the Uruk Period (c.4100-3100 BCE) when the site grew to become one of the first large cities in Mesopotamia, and the mid-third millennium, when historical documents indicate that the site was an important center, but which is little-known archaeologically. From 1999 through 2001, the excavators worked with Learning Sites to build preliminary visualizations of both of these periods. For further information about the site and its excavation history, see their official Website. The excavators were interested in the urban topography of the Uruk Period city, and specifically in the visibility of the Eye Temple across the site and from the surrounding plain. 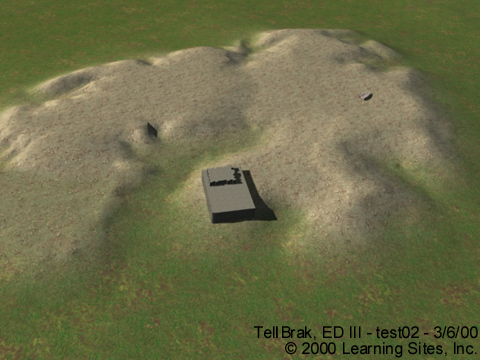 A rendering from our 3D model of the site (at the left; hover over to enlarge) depicts the temple on its platform set on a computer model of the mound as it would have appeared at that time (later layers of the current site were stripped away by Learning Sites for the Uruk-period digital terrain model, based on known elevations of that period published by the various excavations). The test showed how the temple would have visually dominated the site. The excavation team also uncovered a large public building from the mid-third millennium BCE (located at the right-hand side of the mound in the render immediately to the left; hover over image to enlarge). Learning Sites modeled a possible form for the building that took into account prominent man-made features of the topography of the site (and was based on the so-called Temple Oval from Khafaje, due to similarities in the plans of the two buildings). The bottom two renderings at the left are taken from the Learning Sites virtual world of the ED III period. Our process proved extremely valuable for the excavators for planning thier further investigations at the site. 1999 "Excavations at Tell Brak 1998: Preliminary Report," Iraq 61:1-41. 1947 "Excavations at Brak and Chagar Bazar," Iraq 9(1–2):1–266. 2004 The Excavations at Tell Brak 4: Exploring an Upper Mesopotamian regional centre, 1994-96. Cambridge, England: McDonald Institute Monographs. 2012 "Syria: Tell Brak." Current World Archaeology 52:28-34. 1994 "Tell Brak: A Stratigraphic Summary, 1976–1993," Iraq 56:167176.